We had a couple of friends up from Paris visiting us and as we sat down to dinner, I found myself struck, again, about subtle differences in table manners. In the US, you stab your food with the fork held in the left hand, saw at it with the knife held in your right hand, and then you put your knife down, move the fork to the right hand, lift it to your mouth, return the fork to your left hand and repeat the process. What the hell's up with the hand switching? I did it, too. When I was 17 and visiting my grandparents, I finally realized how silly that was and tried to stop switching hands and my grandmother said "If you're going to try to eat European style, try to at least have some table manners." Whereupon she tried (and failed dramatically) to teach me to be polite at the dinner table. Good table manners or bad? Today, I hold my fork in my left hand and use that hand to life the food to my mouth — as does just about everyone in Europe. This silly "constantly pass the fork back and forth from hand-to-hand" nonsense doesn't hold over here. I've also had to adjust to a few other changes. 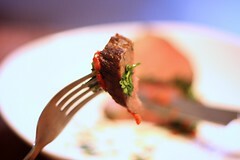 In many parts of the US, lifting food to your mouth with the back of the fork is very poor table manners. In the UK, I found the reverse is often true. And then there was the time my wife and I were visiting a friend in the US and he served us a delicious meal, but with only a fork. No knife. I glanced at my wife and I could see some confusion on her plate, but she said nothing. I honestly don't know if it's a French/US dichotomy, but in the US, some folks will serve single dish meals with only a fork and here, that's unthinkable. You may not notice this stuff, but when I go back to the US, just as I have to be careful to adjust my vocabulary (saying "cheers" with an American accent will get you mocked), I have to adjust my table manners. Many don't notice them ... until they they see someone doing it differently. If you're curious, here's a group of students from around the world discussing table manners in their home countries. Also, in some cultures there are things you must do/say before eating, like a thanksgiving prayer or a "bon appétit" wish. In Japan people say "itadakimasu" before eating, and while it's not a rule per-se, some Japanese friends of mine are so conditioned to it they just can't eat before saying it. I'm also amazed at table manners stuff you're expected to perform after eating. For example, eating everything in your plate can be considered rude (it wasn't enough, you're not satisfied), and *not* eating everything can be rude too (you didn't like the food and/or are wasting). I have noticed a huge difference in just the east coast to the west coast as far as table manners go. I personally never switch hands and when we have friends over I cannot imagine not having knives out as part of a place setting. The difference though is that I was required to attend finishing school. One thing I have noticed that people do a lot is cutting things with their knife and not putting it down, gripping it as if they need to defend their plate. It is one of the first lessons we were given as far as etiquette goes because it comes off very aggressive. Hateful crazy logon process ruined my lovely comment! For any kind of dining etiquette situation you find yourself in, you can always just do what your host does. Soup and whether to empty your plate or not. Even which fork to use. If you are in a different country than your own, you owe it to your fellow country people, to do your research and find out ahead of time. If you are in a restaurant, look to the other patrons or ask your server.